Plan your next outdoor get together with a recipe that everyone will surely love to pair with anything! 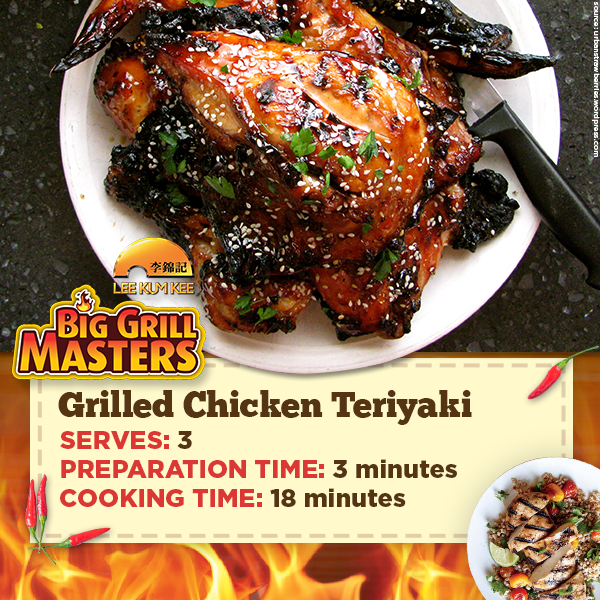 Try this Grilled Chicken Teriyaki and don’t forget to bring your favorite Lee Kum Kee product to make your BBQ Grill moments a lot tastier! 1. Arrange the chicken in a mixing bowl. Pour the teriyaki sauce in the bowl and add garlic powder, salt, and ground black pepper. Mix well. Cover the mixing bowl. Marinate the chicken overnight. Make sure to place the chicken inside the refrigerator. 2. Grill the chicken. You can use any type of grill. I am using a grill plate (on a stovetop). Grill one side of the chicken for 5 minutes and then flip it over and grill the other side for 5 minutes. 3. Remove the skin from the chicken. Continue to grill both sides for 7 to 10 minutes per side or until the chicken is fully cooked. Make sure to baste the chicken with the leftover marinade every 3 minutes to keep it moist. 4. Transfer to a serving plate. Sprinkle sesame seeds on top. Share and enjoy! 2. Pour-in the Lee Kum Kee soy sauce, water, and rice wine. Stir. 3. Gradually add the white and brown sugars. Stir. 4. Add the garlic and ginger. Stir and then cook until the liquid starts boiling. 5. Turn the heat off. Stir to dissolve the sugar. 6. Let the mixture pass through a strainer to trap the garlic and ginger. 7. Let cool and set aside. Teriyaki is one of my favorite flavors! So versatile, I love how you've shown all the different ways to use it. Can't wait to try your recipe!